Like their civilian counterparts and photographers in the other branches of the armed services, Marine combat photographers capture day-to-day events as they happen. These Marines chronicle their fellow troops during wartime and provide images for a variety of different military purposes. It's a dangerous but important role in any Marine unit. Note that this is a job that deals with still cameras and photography. There's a related job, Marine videographer, which is tasked with operating video equipment and shooting video, if you're more interested in moving images than stills. Marine combat photographer is considered a Primary Military Occupational Specialty (PMOS) and is categorized as PMOS 4641. It's open to enlisted Marines whose rank ranges from private to staff sergeant. 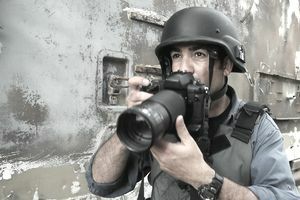 Marine combat photographers use digital cameras and equipment to take photos in a range of conditions and environments. This includes taking photos at night, in inclement weather, during battle operations, and underwater. Their photos may be used for civil affairs, intelligence gathering, investigations, research, recruiting and for documentation purposes. In addition to taking pictures, Marine combat photographers inspect and perform maintenance on photographic equipment, and are responsible for archiving and documentation of still images, and in some cases, assisting Marine videographers. Non-commissioned officers (NCOs) who are combat photographers will supervise other photographers, draft official reports and correspondence, and oversee the photographers' budget. They're charged with supervising and organizing the photography department's operations. To be eligible for the role of Marine combat photographer, you'll need a score of at least 100 on the general technical (GT) segment of the Armed Services Vocational Aptitude Battery (ASVAB) test. You'll need normal color vision, meaning you can't be color blind. Since you'll be handling potentially sensitive images and information, you'll need a secret security clearance for this job. This requires undergoing a background check which will examine your character and your finances. A record of drug or alcohol abuse may be disqualifying for this PMOS, and any criminal offenses will be weighed as well. Marines in this job must be U.S. citizens. As with all Marines, first, you'll complete basic training (otherwise known as boot camp) either in San Diego or Parris Island, South Carolina. Next, you'll take the four-month basic still photographic course at Fort Meade in Maryland. If you can demonstrate proficiency in photography via civilian training or experience, you may be able to forgo part of the training course. Since a majority of the work these Marines do is in combat situations, there's not really a true equivalent to this job in the civilian workforce. However, training as a photographer under extreme conditions should more than qualify you to work as a news photographer, either for a newspaper or online publication. You also should be well-positioned to work as an independent photographer, in such roles as wedding photography or as a studio photographer. How Do I Qualify as a Marine Auto Mechanic?